Apologies for the awful pun, but this issue is far from a laughing matter. 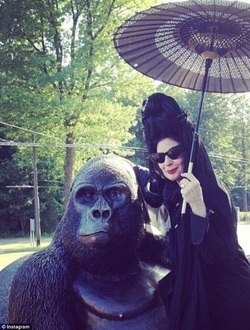 Diane Pernet, a Paris-based writer, found herself in the firing line last week for a crime against, not only fashion, but the conservation of endangered animals. The Vogue columnist stepped out on to Parisian streets wearing –wait for it- a fur jacket. ‘What’s shocking about that?’ you ask. But oh no, not any old fur, the fur of a gorilla. Considering gorillas’ share 98% of their DNA with us it seems impossible to understand what would compel somebody to drape gorilla fur over their shoulders. Nevertheless, at the Paris-fashion week, Diane Pernet débuted her rather macabre look. Gorillas are critically endangered animals (as I’m sure you are all aware) and for a supposed ‘fashion-icon’ to condone the slaughter of them by wearing a gorilla pelt seems absolutely ludicrous. The ethical treatment of animals in the fashion industry has come in leaps and bounds recently, models like Kate Moss even campaigning against the use of real fur. However, this, in my eyes, is a massive step backward. Had she been wearing mink fur, perhaps, the backlash would not have been so strong, but she wasn’t. I find it hard to comprehend why she would pull such a ridiculous stunt, knowing full well the controversy her actions would cause. Yes, fashion is about being evocative, and challenging social constraint, but this, Diane Pernet, was a step too far. A giant, giant step. The controversy surrounding Diane Pernet’s jacket lead me on to the wider issues surrounding fur in the world of fashion, and I made some shocking discoveries. While trawling through articles about the fur trade, in particularly the trade in China, I came across a sickening video uploaded by PETA. The video, filmed by the animal advocate charity, depicted the horrors of the fur trade, exposing the awful truth. Animals, in particular foxes, mink and racoons are crammed into tiny cages. The cages are then tossed off the back of trucks, ready for the animals to be slaughtered (often breaking the animal’s legs in the process). Workers then, in a way I can only describe as barbaric, begin to hack at the animals, in an attempt to remove their fur. The mink, foxes and racoons are all alive through this ordeal. The video shows the workers stamping on the animals heads to momentarily stun them. After being cut, stamped on and skinned alive they bodies are tossed onto a pile. They are disposable. The fur they grow ultimately more valuable than their lives. Some of the more unfortunate creatures are still alive even after this. Writhing, furless and bleeding, in a pit of corpses. This is obviously not an ethical way to treat animals. The ugly side of fashion, one that is rarely shown, has become a pressing issue for charities like PETA. The Chinese government are still yet to ban the mistreatment of animals. Essentially, it is legal to kick a fox, stamp on it, cut it, and skin it alive. China is also the biggest exporter of Angora wool in the world. The wool, which comes from Angora rabbits, is often used for scarfs and hats and is infamous for its softness. This makes it a very lucrative commodity and, as with the fur trade, it has been exploited to make millions. The process of getting the wool off the rabbits is pretty simple. You tie the rabbit down, then savagely rip the fur out of its skin. This industry has also been exposed by PETA, and a video of Angora wool being harvested has been uploaded on their website. I, myself, have watched it and it is very distressing. The rabbits, whose skin is left raw and bleeding, are essentially screaming throughout the ordeal. Their screams, like those of so many other animals, are ignored. Aside from the runways, photo-shoots, and fashion weeks lies the disastrous effects of the industry. We are not the ones dying to look good, the rabbits, minx, foxes and racoons are the ones dying. Millions of animals are slaughtered each day for our own aesthetic gain. I do not expect that anyone reading this has ever brought a mink coat, or even considered buying one. However, this issue is not out of our reach. You don’t need to boycott designers using real fur (by no means is ALL of the fur trade this barbaric), or stage massive protests against the use of it. However, by educating ourselves in the atrocities committed in the name of fashion we can work together to spread awareness for the cause. We can sign petitions and donate to charities like PETA, helping them in their fight against the fur trade. Fashion should be about creativity and controversy, however, if this means that animals should be skinned alive, then count me out. Don’t be a Diane Pernet.